As a rookie with the 1995 Cardinals, David Bell hit a magical home run and became friends with John Mabry. The former gave him a special lifetime memory. The latter helped him reunite with the Cardinals. Bell and Mabry were Cardinals teammates from 1995-98. Both also played for the Mariners in 1999 and 2000. Their friendship helped lead to the decision by Bell to join the Cardinals as assistant hitting coach in 2014 when Mabry was the club’s hitting coach. In 2013, Bell was third base coach for the Cubs. On Nov. 3, 2014, Bell was promoted to bench coach of the Cardinals, replacing Mike Aldrete, who resigned to join the Athletics staff. After the 2017 season, Bell left the Cardinals for a front office position, vice president of player development, with the Giants. On Oct. 21, 2018, Bell was chosen to be manager of the Reds. Bell, whose grandfather, Gus, and father, Buddy, were all-star players in the major leagues, made his big-league debut with the 1995 Indians, appearing in two games before being sent back to the minor leagues. Bell’s best positions were third base and second base, but the 1995 Indians had stellar players at those spots, with Jim Thome at third and Carlos Baerga at second. On July 27, 1995, the Cardinals traded pitcher Ken Hill to the Indians for Bell, pitcher Rick Heiserman and minor-league catcher Pepe McNeal. “I like David Bell,” Cardinals general manager Walt Jocketty told the St. Louis Post-Dispatch. “He’s a guy who has a chance to be a very good major league player for a long time. David Bell was born and raised in Cincinnati. His grandfather Gus Bell had been a standout outfielder for the Reds from 1953-61, four times achieving more than 100 RBI in a season. David’s father Buddy Bell was a premier third baseman. He earned six consecutive Gold Glove awards in the American League from 1979-84. Buddy also played for the Reds from 1985-88. David was the given name of both Gus Bell and Buddy Bell. David Bell was close to both his grandfather and father. On May 7, 1995, four days after David Bell made his major-league debut with the Indians, Gus Bell died. On Aug. 30, 1995, playing in Cincinnati before a Riverfront Stadium crowd that included his grandmother, mother and several other family members and friends, Bell came to bat for the Cardinals in the sixth inning against Reds starter Mark Portugal. The score was tied at 2-2 and Ray Lankford was on first base for St. Louis. Bell hit a Portugal pitch over the left-center field fence for his first big-league home run. The ball caromed off a wall behind the fence and bounced back onto the field. Reds outfielder Darren Lewis retrieved the ball and threw it into the outfield seats. Alerted to the significance of the home run, Lewis got another ball and tossed it into the stands in exchange for the ball Bell hit. The Cardinals won, 4-3. Bell, 22, told the Post-Dispatch he would give the ball to his mother. Used mostly as a utility infielder, Bell hit .225 with four home runs in four seasons with the Cardinals. 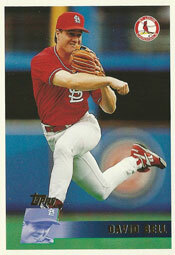 In April 1998, the Cardinals, looking to send Bell to the minor leagues, placed him on waivers. He was claimed by the Indians. Bell played 12 years (1995-2006) in the major leagues for the Indians, Cardinals, Mariners, Giants, Phillies and Brewers. He had a career .257 batting average, with 1,239 hits in 1,403 games. In 1999, Bell had 31 doubles, 21 home runs and 78 RBI as the second baseman for the Mariners. Three years later, Bell was the third baseman for the 2002 National League champion Giants. He had 29 doubles, 20 home runs and 73 RBI that year. In the National League Championship Series against the Cardinals, Bell batted .412 and hit a Game 1 home run off Matt Morris. Bell also hit .304 in the 2002 World Series against the Angels. For pure drama, though, his first home run as a Cardinal is hard to top.